Nessun autore dell’antica Roma ha mai parlato delle navi in questione. Solo Svetonio ci racconta che Caligola si fece costruire navi lussuose con cui navigava lungo le coste della Campania. Delle navi di Nemi invece se ne supponeva l’esistenza perché, già nel medioevo, capitava che, di tanto in tanto, venissero pescati alcuni reperti archeologici. Si fecero diverse ipotesi sia sull’esistenza delle navi che su chi le avesse volute finché, tra i diversi reperti pescati, comparvero le cosiddette fistulae aquaria o plumbee su cui era scritto: “CAESARIS AUG GERMANIC” , cioè Caligola. No author of ancient Rome has ever spoken about these ships. Only Suetonius tells us that Caligula had built luxurious ships on which he sailed along the coasts of Campania.The existence of Nemi’s ships instead was supposed because, already in the Middle Ages, it happened that, from time to time, some archaeological finds were “fished” from the lake. Various hypotheses were made both about the existence of the ships and about who had wanted them, until one day the so-called “fistulae aquaria or plumbee” showed up among the findings and on which it was written: “CAESARIS AUG GERMANIC”, that is Caligula. The ships were built as “entertainment” boats between 37 and 41 AD for the emperor Caligula who had built a new residence on the south-western side of the lake. At the end of his reign the ships went into ruin and sank into the lake. However the muddy water and the absence of the “Teredine” (ship’s worm) in the sweet water, kept the hulls almost intact. The first hull measured 71 meters in length and 20 in width; the second 75 meters in length and 29 in width and was characterized by the presence of long beams placed at regular distances, perhaps designed to take the rowlocks out of the way. Today the most reliable hypothesis is that the first ship was a palace for celebrations and parties, while the second was a veritable “temple” of worship linked to Diana, in line with the sacred character of the place. Il Museo sulla riva del lago – The Museum. Il primo tentativo di recupero fu voluto dal cardinale Prospero Colonna nel 1446. Il cardinale, signore di Nemi e uomo di vasta erudizione affidò il difficile compito a Leon Battista Alberti., il quale chiamò alcuni valenti nuotatori genovesi, i marangoni, che raggiunsero e, per quanto fu loro possibile, esplorarono la nave più vicina alla riva e ne riferirono la distanza e la profondità. Si costruì una piattaforma galleggiante e, con delle corde munite di ganci, si tentò di tirare la nave a riva. Si riuscì invece solo a strappare un pezzo dell’imbarcazione, danneggiandone seriamente la struttura. – The first attempt of recovery was commissioned by Cardinal Prospero Colonna in 1446. The cardinal, lord of Nemi and man of vast erudition entrusted the difficult task to Leon Battista Alberti, who called some famous Genoese swimmers, “the marangoni”, who reached and, as far as they could, they explored the ship closest to the shore and reported its distance and depth. A floating platform was built and, with ropes equipped with hooks, it was attempted to pull the ship to shore. Instead, only a piece of the boat could be torn off, seriously damaging the structure. Il secondo tentativo fu voluto da Francesco De Marchi nel 1535., il quale Marchi decise di immergersi personalmente avvalendosi di una specie di campana .Cominciò ad osservare la nave più vicina alla riva, che era anche quella che giaceva a minor profondità. Si cercò più volte di cingere la nave con fasce e cordami, nel tentativo, inutile, di riportarla in superficie continuando a fare danni. – The second attempt was made by Francesco De Marchi in 1535. Marchi decided to immerse himself personally using a kind of bell. He began to look at the ship closest to the shore, which was also the one that lay at a lower depth. They tried several times to gird the ship with bands and ropes, in an attempt, useless, to bring it back to the surface while continuing to do damage to it. Il terzo tentativo nel settembre 1827. Il nobile cavaliere Annesio Fusconi decise di servirsi nuovamente della campana. Ne costruì una abbastanza grande da contenere otto marangoni. Fu, poi, realizzata una piattaforma galleggiante, piuttosto ampia, idonea a sostenere la campana ed a calarla in acqua mediante quattro argani.Furono allora legate alcune gomene agli argani e si avvolsero delle cime allo scafo. Ancora una volta le corde si ruppero e l’impresa fu rimandata. – The third attempt in September 1827. The noble knight Annesio Fusconi decided to use the bell again. He built a large one enough to hold eight marangoni inside it. It was then built a floating platform, rather large, suitable to support the bell and to lower it into the water through four winches. Then some hawsers were tied to the winches and the tops were wrapped around the hull. Once again the ropes broke and the recovery was postponed again. Il 3 ottobre 1895, su incarico della famiglia Orsini e con il contributo dello Stato, si procedette al quarto tentativo di recupero. Ci si avvalse della collaborazione di un provetto palombaro, che esaminò accuratamente la nave più vicina alla riva e tornò alla superficie con la ghiera di un timone. Si divelsero dallo scafo le famose teste feline e poi, ancora, rulli sferici, rulli cilindrici, cerniere, filastrini in bronzo, tubi di piombo, tegole di rame dorato, laterizi di varie forme e dimensioni, frammenti di mosaici con abbellimenti in pasta di vetro, lamine di rame ed altro. Il 18 novembre venne poi individuata la seconda nave. – On October 3, 1895, on behalf of the Orsini family and with the contribution of the State, they proceeded to the fourth attempt. They took advantage of the collaboration of an experienced diver, who carefully examined the ship closest to the shore and returned to the surface with the rudder’s ring togheter with the famous feline heads, spherical rollers, cylindrical rollers, hinges, bronze filaments, lead pipes, gilded copper tiles, bricks of various shapes and sizes, fragments of mosaics with embellishments in glass paste, copper foils and other things. On 18 November the second ship was then identified. Finalmente nell’anno 1926 si tornò a parlare del recupero delle navi. Fu creata una commissione e dopo un’attenta analisi la commissione ritenne idoneo il metodo di lavoro proposto: l’abbassamento del livello del lago fino a far emergere le due navi. L’incredibile lavoro si svuotamento inizio nel 1928 e terminò nel 1932. Il 20 ottobre 1928 Mussolini avvia lo svuotamento del lago, mettendo in funzione l’impianto idrovoro. Il 31 dicembre i metri cubi di acqua estratti erano circa 5 milioni, la metà di quanto occorse per l’emersione della poppa della prima nave. Alla fine di gennaio 1930 affiorò anche la seconda nave. Finally in the year 1926 it was decided again to talk about the recovery of the ships. A commission was created and after careful analysis the commission accepted the proposed method of work : the lowering of the lake level until the two ships could emerged. 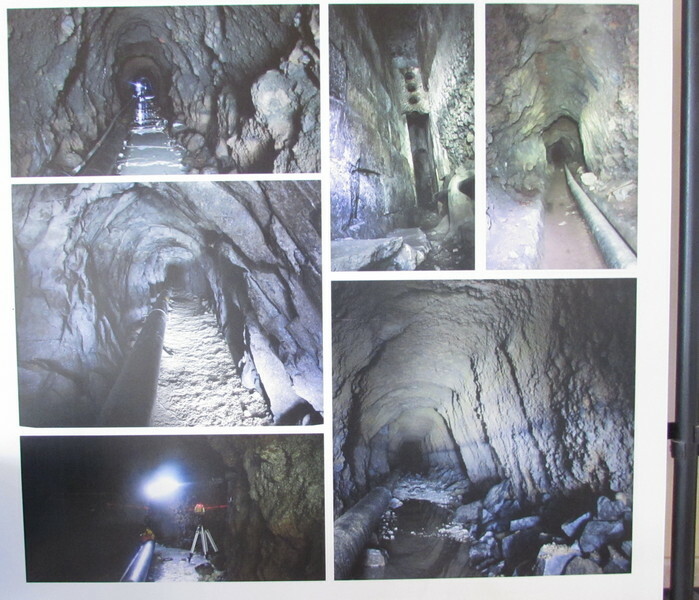 The incredible work of emptying the lake began in 1928 and ended in 1932. On 20 October 1928 Mussolini started the emptying of the lake, putting into operation the water system .On December 31, the cubic meters of water extracted were about 5 million, the half needed for the emergence of the stern of the first ship. At the end of January 1930 the second ship also emerged. Per lo svuotamento si usò l’emissario probabilmente rimaneggiato dai romani nel II sec a.C, in quanto si ritiene fosse preesistente e che servisse per impedire all’acqua del lago di inondare il Tempio di Diana. Una incredibile opera di pulitura e riparazione fu quindi fatta per poterlo utilizzare per lo svuotamento del lago. – To empty the lake it was used the roman emissary which was probably rebuilt by the Romans in the second century B.C. because it was believed to have been pre-existing to be used to prevent the lake’s water from flooding the Temple of Diana. An incredible work of cleaning and repair was therefore made to be able to use it in the emptying of the lake. In un primo tempo le navi vengono ricoverate sulla riva del lago, protette da teloni bagnati la prima nave fu messa all’interno di un hangar concesso dall’aeronautica militare mentre la seconda fu lasciata fuori. Il progressivo deterioramento del legno impose provvedimenti e si decise di costruire sul luogo un vero e proprio museo.Progettato dall’architetto Vittorio Ballio Morpurgo, finalmente nel 1935 la prima nave viene trainata all’interno dell’edificio; il 20 gennaio 1936 viene posizionata anche la seconda. Solo dopo venne terminata la facciata del museo, che fu inaugurato il 21 aprile 1940. – At first the ships were sheltered on the shore of the lake, protected by wet tarps, the first ship was placed inside a hangar granted by the Air Force while the second was left out. The progressive deterioration of the wood imposed strong measures and it was decided to build a real museum on the site. Designed by the architect Vittorio Ballio Morpurgo, finally in 1935 the first ship was towed inside the building; on January 20, 1936, the second was also placed inside. Only afterwards the façade of the museum was finished, which was inaugurated on April 21st 1940 . Degne di nota anche le due grandi àncore ritrovate: la prima in legno con ceppo in piombo della lunghezza di 5 m rappresenta l’unico esemplare di questo tipo completo, conosciuto all’epoca. La seconda, del tipo detto ammiragliato, fino a quel momento si credeva ideata dal capitano inglese Rodger nel 1851 – Also worthy of note are the two large anchors found: the first made of wood with lead headstock of 5 m in length which was the only example of this type, known at the time. The second, the so-called admiralty type, which until that moment it was believed to have been made up by the English captain Rodger in 1851. Il legno usato per le navi apparteneva a “dicotiledoni” (Quercus sessiflora,Quercus pedunculata) i cui esemplari furono presi dai boschi che circondavano il lago e a conifere (Pinus Halepensis, Abies Pectinata) prelevati dagli Appennini. L’analisi ha rivelato l’uso di piante diverse e parti diverse a seconda delle funzioni che dovevano avere. Il fasciame era di legno dolce (pino) e il ponte in quercia. Per le parti che dovevano subire maggiori sforzi furono usati tronchi di alberi con crescita regolare senza nodi. Per evitare corrosioni e deformazioni del metallo molti chiodi erano incapsulati dentro a bussole cilindriche di legno dolce. La carena spalmata con minio di ferro era impermeabilizzata con un rivestimento di stoffa (lana) impregnata di una miscela di pece vegetale e bitume su cui erano applicate con chiodini in rame laminee plumbee spesse 1 mm e lunghe1,40/70 mt. Ottima difesa contro gli attacchi di xilofagi. The wood used for the ships belonged to the “dicotyledons” (Quercus sessiflora, Quercus pedunculata) whose specimens were taken from the woods surrounding the lake and the conifers (Pinus Halepensis, Abies Pectinata) taken from the Apennines Mountains. The analysis revealed the use of different trees and different parts depending on the functions they had to have. The planking was of soft wood (pine) and the bridge in oak. Trunks of trees with regular growth without knots were used for the parts that had to undergo greater efforts. To avoid corrosions and deformations of the metal, many nails were encapsulated inside cylindrical adapters of soft wood. The hull was spread with iron minium and it was waterproofed with a lining of cloth (wool) impregnated with a mixture of vegetable pitch and bitumen on which were applied, with copper nails, thick plumbé laminae of 1 mm and 1.40 / 70 mt. in lenght. Excellent defense against xilophagous attacks. 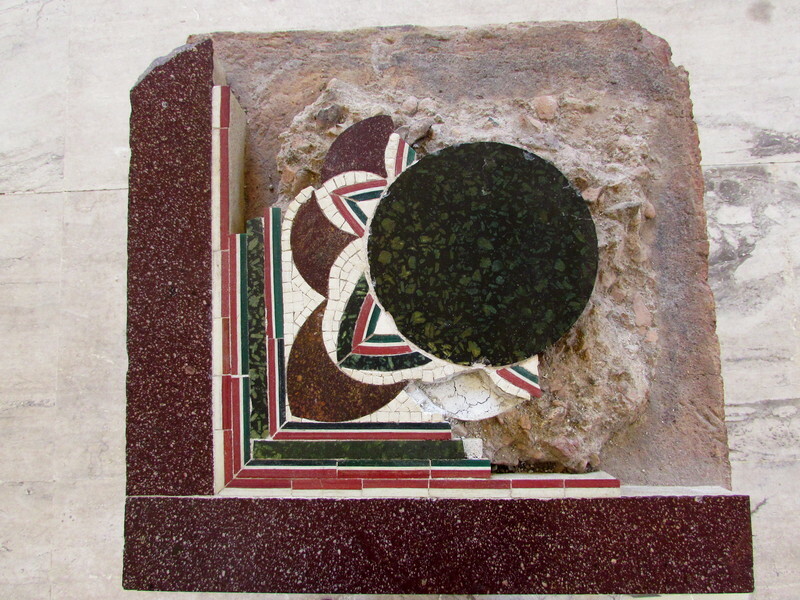 All’interno del museo, un paio di metri sotto al pavimento è visibile la strada basolata che portava al tempio di Diana. La scoperta della strada durante i lavori del museo causò un ritardo nella sua costruzione. 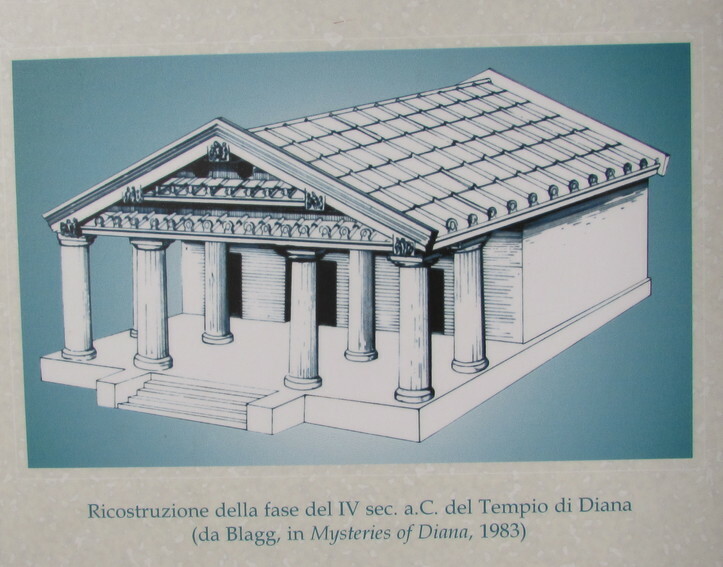 – Inside the museum, a few meters below the floor is visible the ROMAN road that led to the temple of Diana. The discovery of the road during the work of the museum caused a delay in its construction. 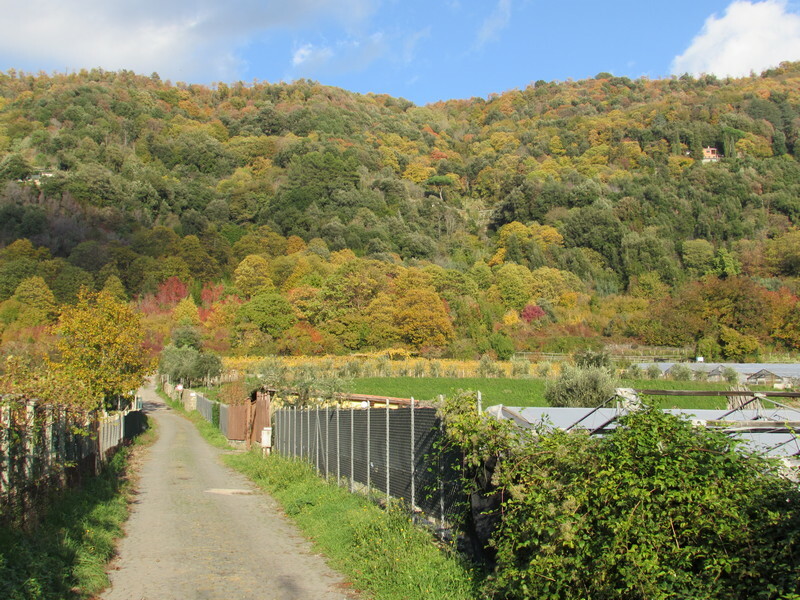 La strada romana che esce dal museo in salita – the roman road exiting the museum uphill. I REPERTI BRONZEI ORIGINALI CONSERVATI A PALAZZO MASSIMO A ROMA – THE ORIGINAL BRONZE OBJECTS SAVED AND KEPT IN PALAZZO MASSIMO. Tra i tanti oggetti trafugati nell’ 800 quando ci furono i tentativi di far riemergere le navi, recentemente è stato ritrovato a New York un prezioso mosaico usato come tavolino. Un quadrato prezioso e colorato con il rosso carminio, il verde, l’ocra e il blu che animano un sontuoso decoro floreale. Ritrovato dai Carabinieri dei beni culturali nella collezione privata di una signora italiana da tempo residente a New York, tornerà presto a casa nel museo delle Navi di Nemi. 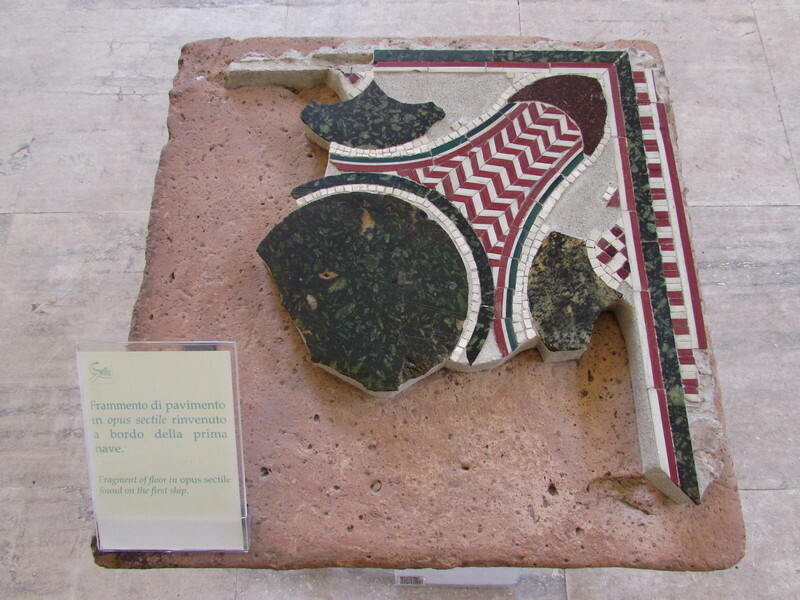 Among the many objects stolen in the ‘800 when there were the attempts to re-emerge the ships, recently it was found in New York a precious mosaic used as a table. A precious and colorful square with carmine red, green, ocher and blue colors that enliven a sumptuous floral decoration. Found by the Carabinieri of the Cultural Heritage in the private collection of an Italian lady who has been living in New York for a long time, it will soon return home in the Naval Museum of Nemi. La notte del 31 maggio 1944, poco prima dell’entrata delle truppe americane a Roma, un incendio devastava il Museo delle Navi e quanto vi era esposto. Il danno fu enorme, poiché andarono perduti tutti i relitti, l’ancora in legno e tutta la documentazione scientifica esposta; fortunatamente nell’agosto 1943 la Sovrintendenza aveva fatto trasportare a Roma nei magazzini del Museo Nazionale Romano i reperti di maggior valore. Venne costituita un’apposita Commissione per verificare le cause dell’incendio e le indagini accertarono che l’incendio fu di natura dolosa, appiccato dall’interno forse dalle truppe tedesche stanziate nei pressi del sito, anche se in realtà altre ipotesi non sono da escludere, come quello di voler rubare da parte di locali il materiale e gli oggetti di metallo. On the night of May 31, 1944, just before the entry of American troops to Rome, a fire ravaged the Ship Museum and all that was exhibited there. The damage was enormous, since all the wrecks, the wooden anchor and all the scientific documentation exposed were lost; fortunately, in August 1943, the Superintendent had the most valuable findings transported to Rome in the Roman National Museum’s warehouses. A special commission was established to verify the causes of the fire and the investigations ascertained that the fire was of a malicious nature, set from inside the building perhaps by the German troops stationed near the site, even if other hypotheses are not to be excluded, like that of wanting to steal the material and metal objects by local people. Statua marmorea colossale rinvenuta a Fiumicino nel 2011. La statua supera i 2,50mt in marmo greco di Taso raffigura un uomo giovane seduto su un trono. Veste un mantello e calzari aperti (caligae speculatoriae). 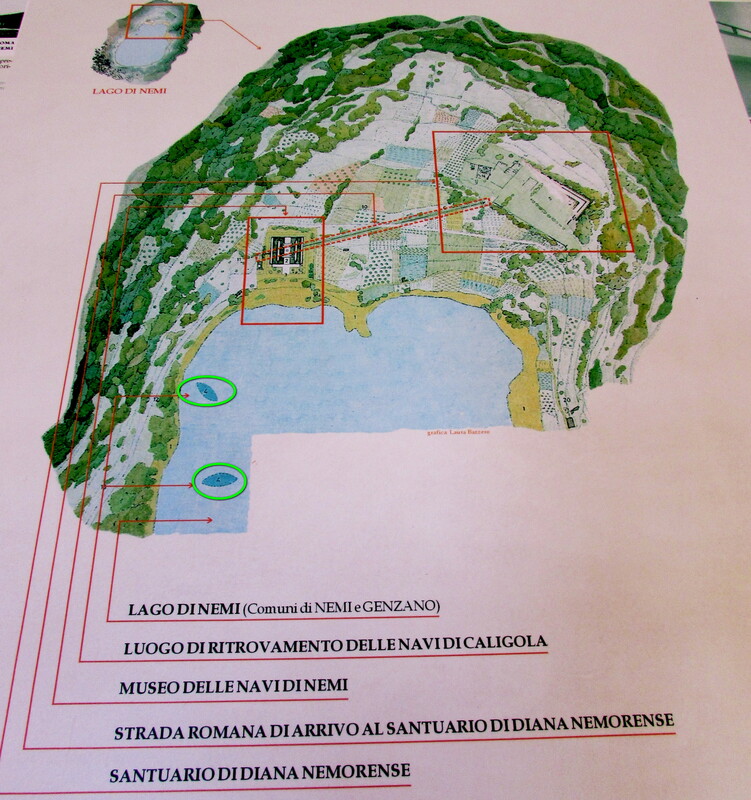 Lo stile e la provenienza (lato orientale del lago di Nemi) fanno presupporre che sia l’imperatore Caligola che in quella zona si fece costruire una bellissima villa. – Colossal marble statue found in Fiumicino in 2011. The statue exceeds 2.50 meters, made in Greek marble of Thasos depicts a young man seated on a throne. He wears a cloak and open shoes (caligae speculatoriae). The style and the provenance (eastern side of the lake of Nemi) suggest that it may be emperor Caligula who had a beautiful villa built in that area. IL LAGO DI NEMI – The big circle where the ships where found. On the top right where Diana’s temple was. In the middle the Museum. Questo articolo è stato pubblicato in Archeologia, Musei italiani, Storia Romana e contrassegnato come Caligola, Nemi da karollxviii . Aggiungi il permalink ai segnalibri.